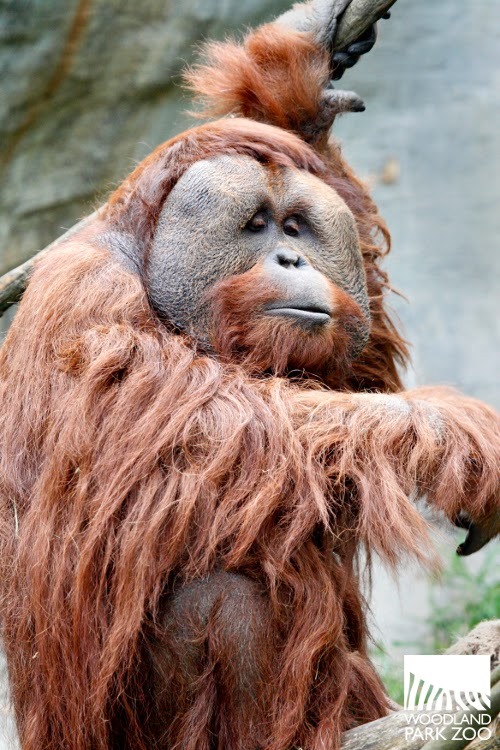 Woodland Park Zoo’s Towan inspired much of the orangutan character, Maurice, in Rise of the Planet of the Apes and Dawn of the Planet of the Apes. Photo by Dennis Dow/Woodland Park Zoo. For those of us who work with Towan, the oldest male orangutan in North America, we've always known that he's a special guy. Now, people all around the world will see much of his personality come to life on the big screen when “Dawn of the Planet of the Apes” hits theaters this month. That’s because Karin Konoval, the actor who plays Maurice the orangutan in the new Planet of the Apes films, studied and drew her inspiration from our big guy. Maurice the orangutan in Dawn of the Planet of the Apes, photo courtesy of 20th Century Fox. At 46 years old, Towan and his twin sister Chinta have lived their entire lives at Woodland Park Zoo. They were both hand-raised by humans and show great interest in people, especially the regular visitors that come to see them in the zoo’s Trail of Vines exhibit. Towan checks out a young visitor. Photo by Dennis Dow/Woodland Park Zoo. 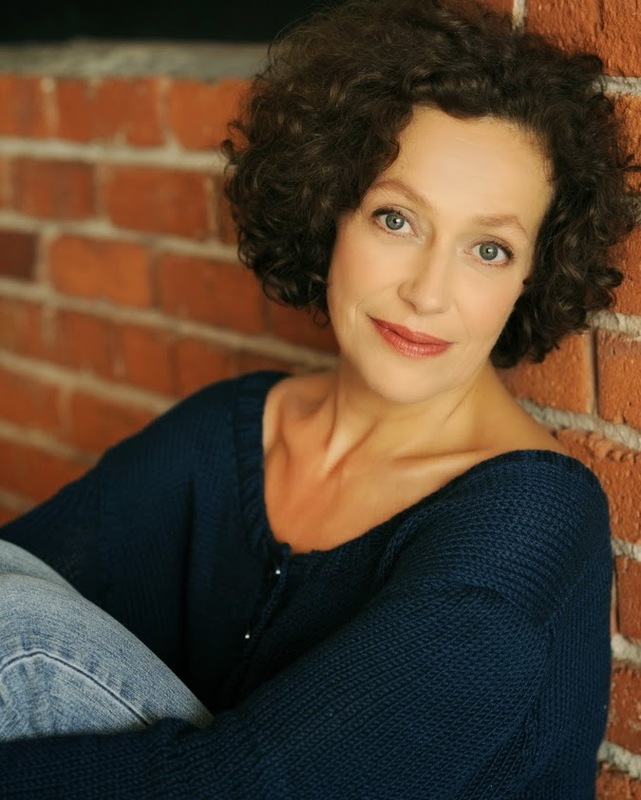 Actor Karin Konoval is one of those regular visitors. It’s easy to see why she and others are drawn to Towan. He is wise, strong willed, enjoys attention, loves to manipulate objects, and is also artistic. For many years he's been given paint and canvas or sidewalk chalk and paper, and he spends quite a bit of time working away at his given medium. You can see the wheels turning (so to speak) as he studies a canvas, paper, or even parts of his exhibit and colors them with delight. Actor Karin Konoval, courtesy of the actor. The Vancouver, Canada actor began visiting Woodland Park Zoo in 2010 to study the orangutans, and she has been regularly connecting with the keepers since 2011. Before we even knew that Towan played a pivotal role in the development of Karin’s Maurice character in the first film, the Lead Keeper of Primates commented after seeing “Rise of the Planet of the Apes” that the male orangutan in the movie "reminds me so much of Towan." We asked Karin to chat with us about her role as Maurice in the Planet of the Apes films and what she has learned in developing this character. Can you explain how you are morphed into an orangutan on the big screen? KK: Maurice comes to life on the big screen through a process called "performance capture." What this means is: as an actor I deliver the full performance of him just as I would with any human character—his physical movement, thoughts, choices, facial expressions, voice. During filming I wear a gray body suit rigged with sensors that track the movement of every part of my body, a helmet camera that tracks my facial expressions in meticulous detail, and a sound microphone. In post-production Weta Digital renders the "digital makeup" of Maurice over my performance. 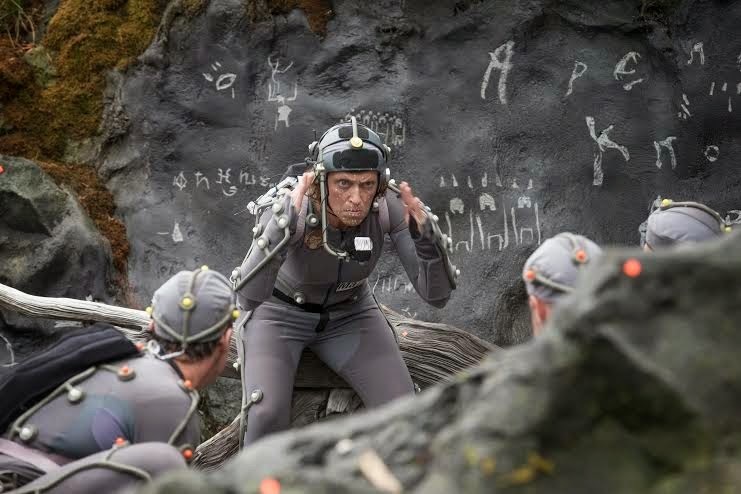 Weta Digital is entirely involved throughout filming and the technical process of performance capture is incredibly sophisticated—in the technology used, expert technicians involved at every moment, and the expert minds overseeing from start to finish. “Dawn of the Planet of the Apes” was filmed in all the locations as you see them in the film, i.e., not in front of a green screen. We also filmed in extremely challenging environments: rain, mud, in a lake, on steep hillsides, on horseback, etc. 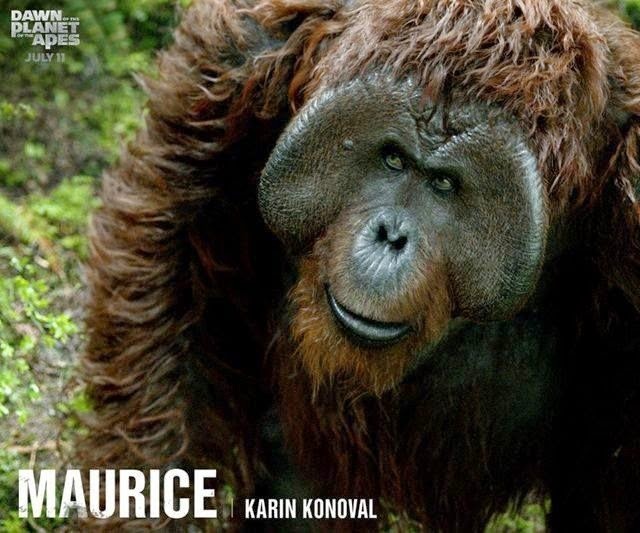 Karin Konoval as Maurice in Dawn of the Planet of the Apes, photos courtesy of 20th Century Fox. 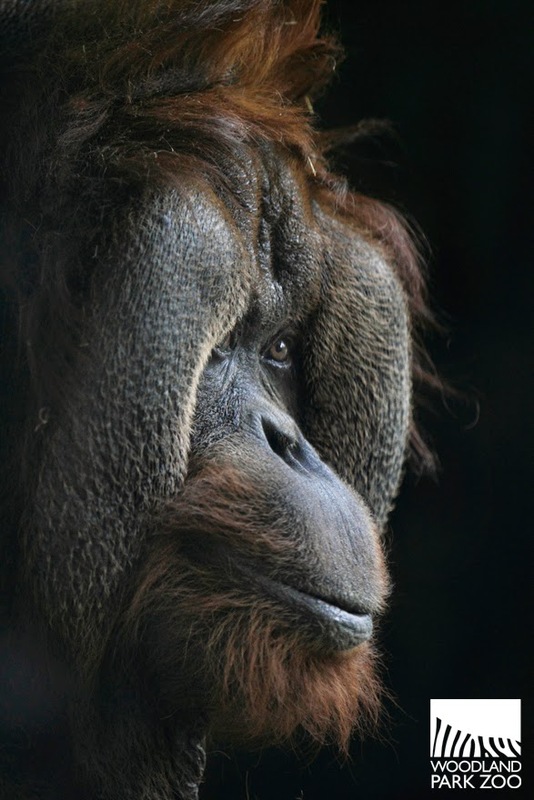 What did you learn from Towan about orangutans and what part of him can we see in Maurice? KK: Towan gave me what I can only describe as the "key" to Maurice. Before I met him the first step for me as an actor on my learning journey to portray a mature male orangutan was to read every book and watch every video about orangutans I could find, absorbing as much as I could of their physicality, behavior and energy. I spent weeks practicing on quadrupedal arm stilts, climbing things, eating like an orangutan and practicing long calls in the shower. Towan wasn't the first orangutan I met. That was Bruno in Los Angeles, who became feisty and impatient with me, and the feistier he became the more he gave me to bring into Maurice. Filming for "Rise" had already begun at the end of July 2010 when I still felt like I was all in bits and pieces with my portrayal of Maurice—like I was missing something. One day I saw a video of Towan painting, which intrigued me because I'm a painter too. So I came to Woodland Park Zoo. I sat down at a window to watch Towan—he was about ten feet away from me with a burlap blanket over his head. Every once in a while a corner of the blanket would poke up and he'd peek at me. Then suddenly: he tossed off the blanket and leapt to the window to press his face to mine. For twenty minutes his eyes studied up and down my face. And in that time, somehow, Towan gave me the magic key to Maurice. I can't explain it better than that. Whatever he gave me was far richer than I could describe in words. Towan painting. Photo by Carolyn Sellar/Woodland Park Zoo. What behaviors that we see in your character Maurice have you picked up from other orangutans over the years? KK: That's a fun question to consider. I've spent a fair amount of time visiting with [Woodland Park Zoo’s] Towan, Melati, Chinta, Heran and Bela over the past three years and they are constantly surprising me with their individual interests, behavior, and unique ways of communicating. By the time filming of "Dawn" began I had a wealth of knowledge to call upon that I didn't have going into "Rise." There are many things I've observed in them that I brought into my performance of Maurice. The way Chinta sometimes applauds when I get out the paints—a happy "clap clap" of her hands. The way Melati points at colors she wishes me to use when I'm painting, or shakes her head no to a color, or shrugs her indifference. The way Towan draws with chalk, and "crutch walks" down a hill. The way Heran plants himself when hyper alert or making a stand. The way he excitedly bangs his hands on the ground after filling a tub with hay or delighting himself with some activity. The way I've seen Melati gently reach out and put her hand on his shoulder. Heran is Melati's son, and I've witnessed very dear moments between them. The way each of them eats, the way each of them watches. Towan's and Heran's long calls, which I've put a great deal of effort into getting into my/Maurice's voice for his more excitable moments. Other gentle breathing sounds that I've heard sporadically from Towan, and barks from Melati. I also spent time with four orangutans at Zoo Atlanta last May, Chantek, Nicky, Alan and Biji. They each moved me deeply in different ways, and elements of Alan's and Biji's personalities had an effect on my portrayal of Maurice too. Chantek can communicate through sign language, and to my delight he and I had two very brief sign language exchanges that also influenced me. But it's what I've absorbed of Towan's incredible "all-seeing" presence and stillness that's at the heart of Maurice. 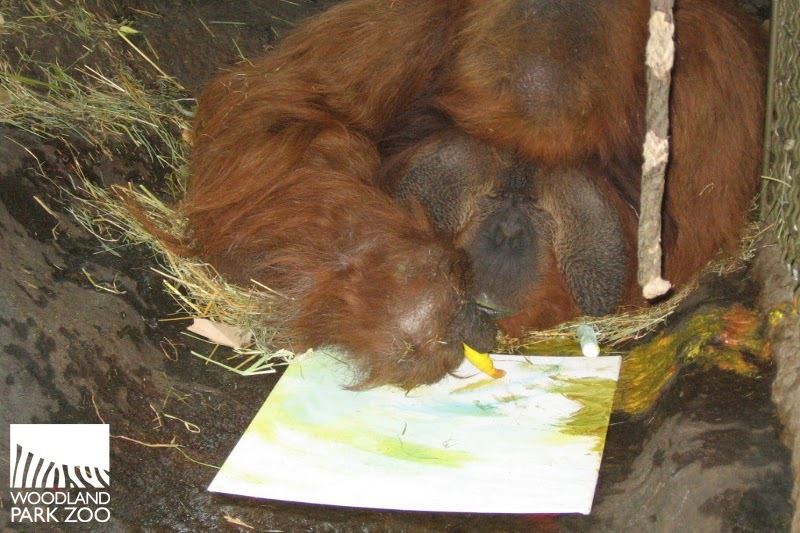 Karin also drew inspiration from other orangutans, like sweet natured Chinta, Towan’s twin sister. Photo by Dennis Dow/Woodland Park Zoo. How has playing an orangutan differed from your other acting roles? KK: In one way, it's no different at all. As an actor I approach each character I play with the same intent: find the character's integrity of mind, spirit, action. Tell the story, find my place in it. To find the integrity of Maurice as a character has been no different than finding the integrity of any human character. That said, the fact that he's a mature male orangutan has made it one of the most challenging and rewarding roles I've ever played. There's a special quality to him. To enter the state of mind of a character like Maurice is to embrace a quietness, a solitude, a listening and watchfulness. It's a refreshing state of mind to enter and maintain as an actor. Towan watches actor Karin Konoval get creative. Photo courtesy the actor. What interests you most about orangutans? KK: That's a question I've been asking myself for four years. The moment I first looked at a picture of an orangutan in a book in June 2010 I had a visceral reaction to it, an inexplicable something-shifting-inside-me reaction. This was before the callback for what I didn't yet know was the role of Maurice. Since then, in my personal life and aside from any connection to the films, I've felt compelled to get to know as much about orangutans as a species and in particular the incredible individuals I've had the chance to meet —Towan, Melati, Chinta, Heran, Bela, Alan, Biji, Chantek, Nicky, Rosie, Intan, Bruno. There are orangutan individuals I know only through pictures and stories who have captivated me too and I hope very much I'll have the chance to meet them. Linus at Center For Great Apes in Florida, for example. What is it about orangutans that fascinates me? I guess the best answer is whatever happened the first time I met Towan and he studied up and down my face. It's inexpressible—in words, at least. Towan. Photo by Dennis Dow/Woodland Park Zoo. 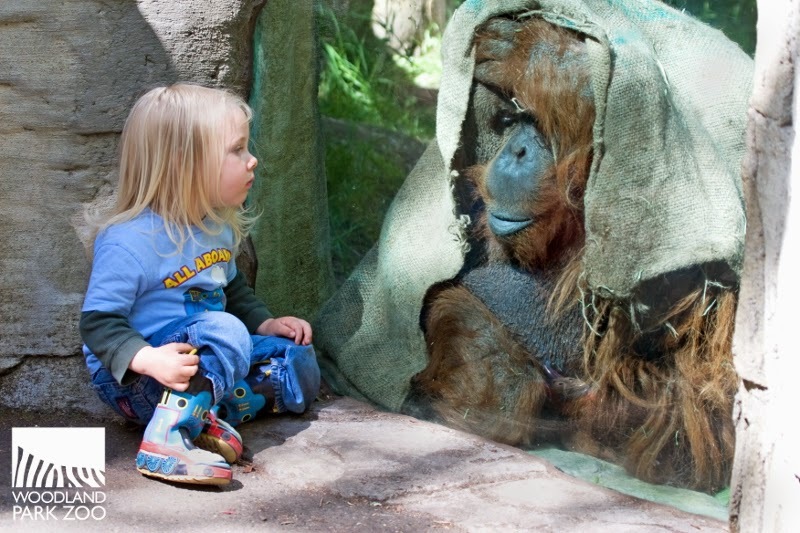 As a Woodland Park Zoo member, what is your favorite thing about visiting the zoo and the orangutans? KK: There's so much I love about visiting Woodland Park Zoo. The ongoing journey of getting to know Towan, Bela, Chinta, Heran and Melati is fascinating and rewarding. But there are many other aspects to my visits that I value greatly. I've had the chance to get to know the gorillas, and in particular love to visit with Nina and Pete every time I come. The welcome offered to me not just by the great orangutan staff but also by everyone working at gorillas. I've learned as much from the incredible human beings who work at Woodland Park as I have from the animals they care for—and look forward to reconnecting with them each visit every bit as much as with the orangutans. I've had the chance to meet the giraffes, sloth bears, lemurs, jaguars, elephants. Perhaps one of the most special things the orangutans have brought into my life is a fresh sense of perspective. A curiosity about, consideration of and respect for all other animal species, not just orangutans. 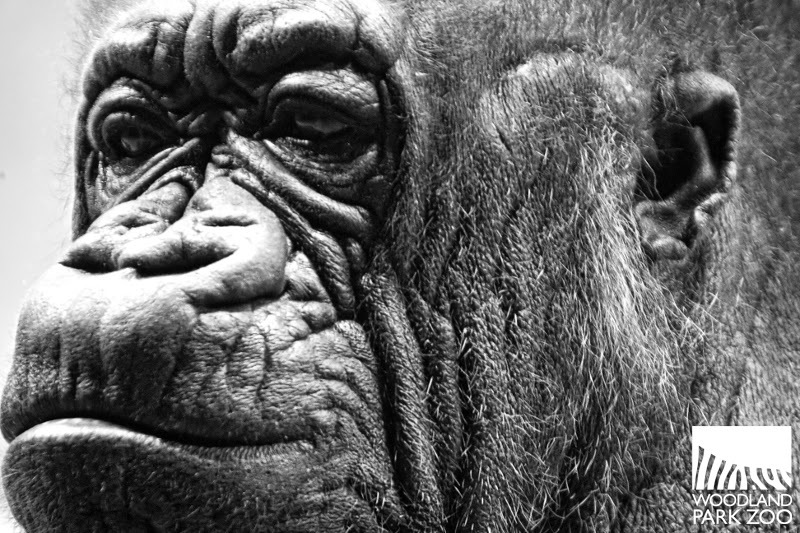 Konoval has also spent time observing Nina and other gorillas at the zoo. Photo by Mat Hayward/Woodland Park Zoo. If you could share anything with the public about orangutans what would it be? KK: What comes first to mind is: gratitude. My personal gratitude to the orangutans I've met, and the people who work with and on behalf of them, for welcoming and guiding me into a world I was actively curious about but knew little of and has now become an enriching part of my life. That may sound like a non-answer but I mean it in a larger way: to spend time in the presence of an orangutan is a gift. They offer a living, breathing lesson in the value of quiet and stillness, listening, keen observation, patience. As individuals they are richly unique in character and in the three years I've been visiting Towan, Melati, Chinta, Heran and Bela they each keep surprising me in ways that make me realize I've barely begun to know them. The sophistication of their thinking and "considering" nature has made me in turn consider afresh, as I said above, the sentience of all other animal species. In my growing respect for orangutans I have a deeper sense of humility about myself as a human being, and a new perspective on the world. Whether others find the opportunity to experience this connection and opportunity to learn with orangutans or ANY other animal species, it's that experience that I'd most wish to share. Melati comes in for a close up. Photo by Dennis Dow/Woodland Park Zoo. Are you involved in orangutan conservation? 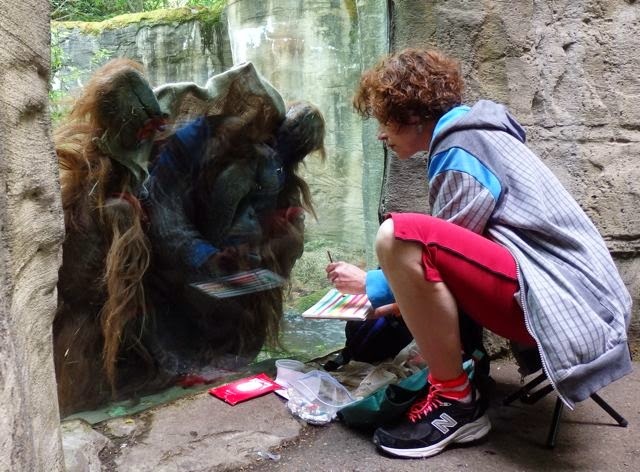 KK: First, I'm so happy to be able to support Woodland Park Zoo's own conservation efforts through being an annual donor as a ZooParent since I became a member. In 2012 I had the opportunity to attend the Orangutan Species Survival Plan (SSP) Conference in Portland, and to hear (among many other fine speakers) Dr. Ian Singleton speak on behalf of his work with the Sumatran Orangutan Conservation Program. In Sumatra orangutans are on the critically endangered list. I was deeply impressed by Dr. Singleton and so follow the work of SOCP. I also follow the work of Patti Ragan and the Center For Great Apes in Wauchula, Florida. They provide sanctuary for orangutans and chimpanzees retired or rescued from lives as performers, as pets, or in research situations. As an actor with firsthand experience in the potential for the technology of performance capture to end the use of great apes in entertainment, this is obviously an important issue to me. The Orangutan SSP has also proved an invaluable educational resource to me, and chair Lori Perkins and many other members have been so generous in their guidance, so I follow their work too. First and foremost I consider myself a lucky student of orangutans, and in anything I'm able to give in return it's simply a way of saying "thank you." Woodland Park Zoo partners with the Gunung Palung Orangutan Conservation Program to protect wild orangutan populations. Photo by Tim Laman. As a zookeeper, I could see that the orangutans were instantly taken with Karin, and they continue to enjoy visiting with her through the glass. Apes can tell if a person is comfortable around them and “ape people”—usually ape caretakers—have a special understanding of them. The orangutans recognize that. It was that same recognition that happened when Karin visited. I was baffled by it at first, but then quickly realized how Karin, the actor, had not followed a usual pathway to understand apes by working with them. She'd gained this understanding on her own by embodying an ape on screen. Towan’s son, Heran. Photo by Dennis Dow/Woodland Park Zoo. One important thing I've learned over the years is that while we have certain expectations of what orangutans are capable of thinking and doing, they constantly surprise us. As an actor and behaviorist, Karin was an open book when it came to what she thought orangutans were capable of. For me that's been the exciting part of getting to know her, watch as she learns more, and see that come alive on screen. Karin on set as Maurice in Dawn of the Planet of the Apes, photo courtesy of 20th Century Fox. 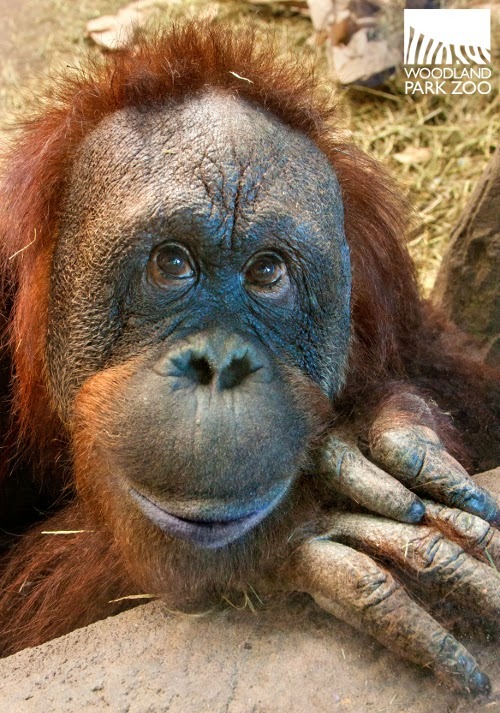 Maurice the orangutan is Karin Konoval, but he is also part Towan. Karin talks about not being able to describe what Towan gave to her, but to me it seems he shared the most important part: his self-assurance, his wisdom, and like all orangutans, his nature as a sentient being. A big thank you to Karin for taking time to answer our questions and for representing orangutans on the big screen. 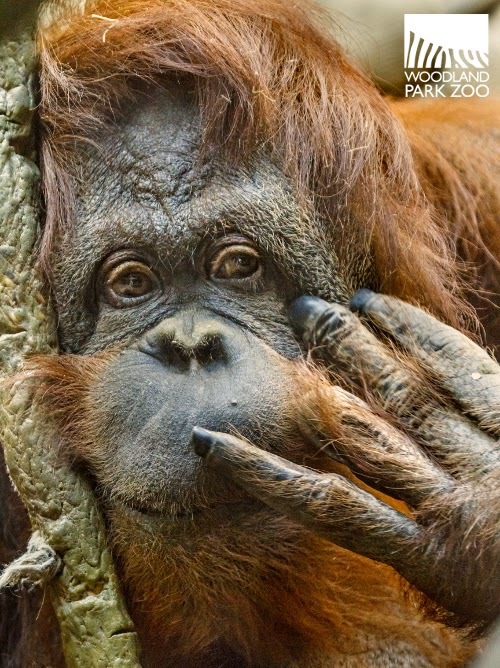 Come visit Towan and the orangutans at Woodland Park Zoo and see what they inspire in you! Awesome! Maurice was my favorite character in Dawn! Great article! Would love to hear an update in the future.